I like light and the desert landscape. I've been hiking and photographing in the Southwest deserts for over 30 years. Each year I find new territory to explore with my legs and my camera, and each year I am more amazed with the light that I see. When I first started taking pictures, I enjoyed traveling to well known places to capture the light I had seen in books and magazines. Many times, however, I planned outings centered on catching a particular light event, such as moonrise or sunset, only to find that the image I had envisioned failed to materialize. Light, it seemed, would have its way with me regardless of my intentions. So over the years, capturing light has become less and less my goal. Instead, I increasingly prefer to give in to the unpredictability of the situation and simply allow the light to capture me. My favorite moments are when light quietly chooses to show itself in unexpected ways and in unanticipated places. There is intense focus in these moments as I scramble to allow the camera to participate in the event. And over time, these chance encounters with light have become my favorite images. 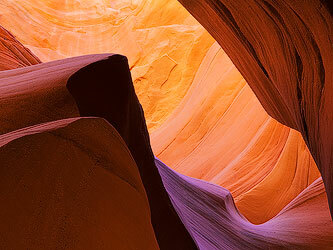 That's mostly what you'll see on the pages of this website, less familiar and perhaps even unknown places exposed in light that reveals the natural beauty of the desert in new ways. Hopefully this light will capture you the same way it did me.